Muscle contusion indicates a direct, blunt, compressive force to a muscle. Contusions are one of the most common sports-related injuries. [1, 2, 3] The severity of contusions ranges from simple skin contusions to muscle and bone contusions to internal organ contusions. Although all tissue and organ contusions can result from traumatic sports injury, this article focuses on muscle contusions. Contusions of internal organs and bone contusions are not discussed in this article (see the Medscape Reference articles Concussion, Sacroiliac Joint Injury, Femur Injuries and Fractures, and Hip Pointer). For excellent patient education resources, visit eMedicineHealth's Skin Conditions and Beauty Center and Eye and Vision Center. Also, see eMedicineHealth's patient education articles Bruises and Black Eye. 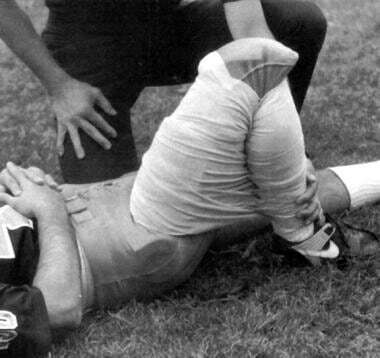 Athlete with a quadriceps strain. Place knee passively in 120º of flexion and immobilize with a double elastic wrap in a figure-8 fashion. This should occur within minutes of the injury. Used with permission courtesy of John Aronen, MD. 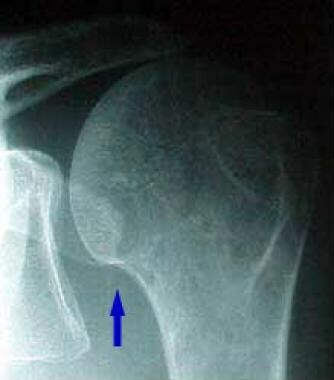 Rotator cuff contusions of the shoulder have also been seen in professional football players. Cohen et al evaluated the incidence, treatment, and magnetic resonance imaging (MRI) appearance of players sustaining such injuries in a North American professional football team.  . The team's injury records from 1999 to 2005 were retrospectively reviewed for athletes who had sustained a rotator cuff contusion of the shoulder during in-season participation. Cohen et al determined that rotator cuff contusions composed nearly half of all shoulder injuries in the football players in their study,  but the majority of affected athletes are able to return to sports with conservative treatment. A minority of shoulders might progress to more severe injuries such as rotator cuff tears. See the images below. The international frequency of contusions is similar to that in the United States. Skeletal muscle constitutes the largest tissue mass in the body, comprising up to 45% of the total body weight. Muscles that cross a single joint are located close to bone, are frequently responsible for postural maintenance, and are most susceptible to contusions. On the other hand, 2-joint muscles, such as the rectus femoris muscle, lie more superficial and are more susceptible to stretch-induced strain injury. Contusions are caused by blunt trauma to the outer aspect of the muscle, resulting in tissue and cellular damage and bleeding deep within the muscle and between the muscle planes. The resultant tissue necrosis and hematoma lead to inflammation. Little is known about the role of the inflammatory process and its importance in the healing process. Clearly, too much inflammation is unfavorable, but too little may be just as devastating. A bruise is caused by blood that has escaped from damaged capillaries into the interstitial tissues. Within a few hours after the injury, the presence of necrotic tissue and hematoma initiates an inflammatory reaction. Because inflammation initiates macrophage action with subsequent phagocytosis of necrotic debris and stimulation of capillary production, it is vital to the process of muscle regeneration. However, inflammation invariably causes edema that leads to anoxia and further cell death. Best TM. Soft-tissue injuries and muscle tears. Clin Sports Med. 1997 Jul. 16(3):419-34. [Medline]. Kasemkijwattana C, Menetrey J, Somogyl G, et al. Development of approaches to improve the healing following muscle contusion. Cell Transplant. 1998 Nov-Dec. 7(6):585-98. [Medline]. Nozaki M, Li Y, Zhu J, et al. Improved muscle healing after contusion injury by the inhibitory effect of suramin on myostatin, a negative regulator of muscle growth. Am J Sports Med. 2008 Dec. 36(12):2354-62. [Medline]. Jackson DW, Feagin JA. Quadriceps contusions in young athletes. Relation of severity of injury to treatment and prognosis. J Bone Joint Surg Am. 1973 Jan. 55(1):95-105. [Medline]. [Full Text]. Rothwell AG. Quadriceps hematoma. A prospective clinical study. Clin Orthop Relat Res. 1982 Nov-Dec. 171:97-103. [Medline]. Kary JM. Diagnosis and management of quadriceps strains and contusions. Curr Rev Musculoskelet Med. 2010 Jul 30. 3(1-4):26-31. [Medline]. [Full Text]. Ueblacker P, Mueller-Wohlfahrt HW, Ekstrand J. Epidemiological and clinical outcome comparison of indirect ('strain') versus direct ('contusion') anterior and posterior thigh muscle injuries in male elite football players: UEFA Elite League study of 2287 thigh injuries (2001-2013). Br J Sports Med. 2015 Mar 9. [Medline]. Cohen SB, Towers JD, Bradley JP. 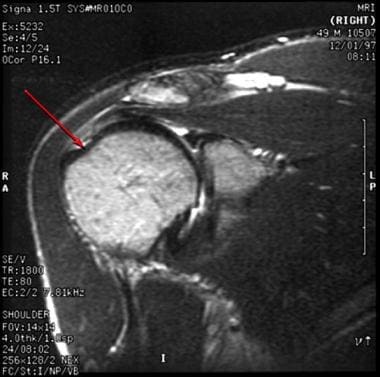 Rotator cuff contusions of the shoulder in professional football players: epidemiology and magnetic resonance imaging findings. Am J Sports Med. 2007 Mar. 35(3):442-7. [Medline]. Farges MC, Balcerzak D, Fisher BD, et al. Increased muscle proteolysis after local trauma mainly reflects macrophage-associated lysosomal proteolysis. Am J Physiol Endocrinol Metab. 2002 Feb. 282(2):E326-35. [Medline]. [Full Text]. MacAuley D. Do textbooks agree on their advice on ice?. Clin J Sport Med. 2001 Apr. 11(2):67-72. [Medline]. Deal DN, Tipton J, Rosencrance E, Curl WW, Smith TL. Ice reduces edema. A study of microvascular permeability in rats. J Bone Joint Surg Am. 2002 Sep. 84-A(9):1573-8. [Medline]. Schwartz AJ, Ricci LR. How accurately can bruises be aged in abused children? Literature review and synthesis. Pediatrics. 1996 Feb. 97(2):254-7. [Medline]. Kneeland JP. MR imaging of muscle and tendon injury. Eur J Radiol. 1997 Nov. 25(3):198-208. [Medline]. Kneeland JB. MR imaging of sports injuries of the hip. Magn Reson Imaging Clin N Am. 1999 Feb. 7(1):105-15, viii. [Medline]. Bencardino JT, Rosenberg ZS, Brown RR, et al. Traumatic musculotendinous injuries of the knee: diagnosis with MR imaging. Radiographics. 2000 Oct. 20 Spec No:S103-20. [Medline]. [Full Text]. Wilkin LD, Merrick MA, Kirby TE, Devor ST. Influence of therapeutic ultrasound on skeletal muscle regeneration following blunt contusion. Int J Sports Med. 2004 Jan. 25(1):73-7. [Medline]. Rantanen J, Thorsson O, Wollmer P, Hurme T, Kalimo H. Effects of therapeutic ultrasound on the regeneration of skeletal myofibers after experimental muscle injury. Am J Sports Med. 1999 Jan-Feb. 27(1):54-9. [Medline]. Beiner JM, Jokl P, Cholewicki J, Panjabi MM. The effect of anabolic steroids and corticosteroids on healing of muscle contusion injury. Am J Sports Med. 1999 Jan-Feb. 27(1):2-9. [Medline]. Rahusen FT, Weinhold PS, Almekinders LC. Nonsteroidal anti-inflammatory drugs and acetaminophen in the treatment of an acute muscle injury. Am J Sports Med. 2004 Dec. 32(8):1856-9. [Medline]. Thorsson O, Rantanen J, Hurme T, Kalimo H. Effects of nonsteroidal antiinflammatory medication on satellite cell proliferation during muscle regeneration. Am J Sports Med. 1998 Mar-Apr. 26(2):172-6. [Medline]. Torres RJL, Hattori S, Kato Y, Yamada S, Ohuchi H. Ultrasonography and return to play of the different clinical grading of quadriceps contusions: a case series. J Med Ultrason (2001). 2018 Apr. 45 (2):375-380. [Medline]. Mishra DK, Fridén J, Schmitz MC, Lieber RL. Anti-inflammatory medication after muscle injury. A treatment resulting in short-term improvement but subsequent loss of muscle function. J Bone Joint Surg Am. 1995 Oct. 77(10):1510-9. [Medline]. [Full Text]. Powell JW, Barber-Foss KD. Injury patterns in selected high school sports: a review of the 1995-1997 seasons. J Athl Train. 1999 Jul. 34(3):277-84. [Medline]. [Full Text]. Punwar S, Hall-Craggs M, Haddad FS. Bone bruises: definition, classification and significance. Br J Hosp Med (Lond). 2007 Mar. 68(3):148-51. [Medline]. Sun JH, Wang YY, Zhang L, et al. Time-dependent expression of skeletal muscle troponin I mRNA in the contused skeletal muscle of rats: a possible marker for wound age estimation. Int J Legal Med. 2009 Jan 28. epub ahead of print. [Medline]. Wankhede AG. The bruise which depicted the pattern of subjacent bone. Forensic Sci Int. 2009 Apr 15. 186(1-3):e5-7. [Medline]. Lateral view of the neck showing calcification in the paraspinal muscles. Image contributed by Ajay K. Singh, MD, William Beaumont Hospital, Royal Oak, Mich.
A 6-year-old girl who presents a few days after being disciplined on the buttocks with a wooden spoon by her mother. This pattern of bruises is of suspicious shape, number, and location. Picture of compartment pressure measuring device for use when commercial devices are unavailable. Stryker STIC Monitor. Image courtesy of Stryker Corporation, used with permission. An illustration that depicts measurement of compartment pressures in the forearm. Anteroposterior radiograph of the right hip in a 16-year-old boy who had suffered trauma to the hip 2 years previously (same patient in Images 10-11). The patient is currently experiencing hip pain. Mature heterotopic ossification (arrowheads) projects over and lateral to the femoral head. Corresponding lateral view of the right hip (same patient in Images 10-11). Distal to the mature heterotopic ossification (HO) seen on the anteroposterior view (arrowheads) is a subtle area of early mineralization (arrows) consistent with early HO. The authors and editors of Medscape Reference gratefully acknowledge the contributions of previous author, Brett J Earl, MD, to the development and writing of this article.